It’s one thing to know that simply sticking to videos online doesn’t result in effective learning or high retention rates. It’s another to create online training that’s markedly more effective. GeT Interactive is the multi-modal eTraining design and methodology that helps users learn skills faster, retain knowledge longer and apply it to real-world projects better. It is built on over 30 years of experience delivering effective computer-based training and is recognized by the education industry as a leader in its field. Global eTraining’s interactive course training reaches students with varied learning styles through text, audio, demonstrations, exercises, and videos, engaging all the senses and anchoring learning with action. GeT courseware integrates all of these because 61% of learners require a combination of learning styles to learn best, while only 17% benefit from any single style. Learn Faster. Retain More. Save Time. GeT Interactive seamlessly combines text, audio instruction, video demos, hands-on exercises, competency assessments and immediate feedback to replicate the best classroom learning experience. 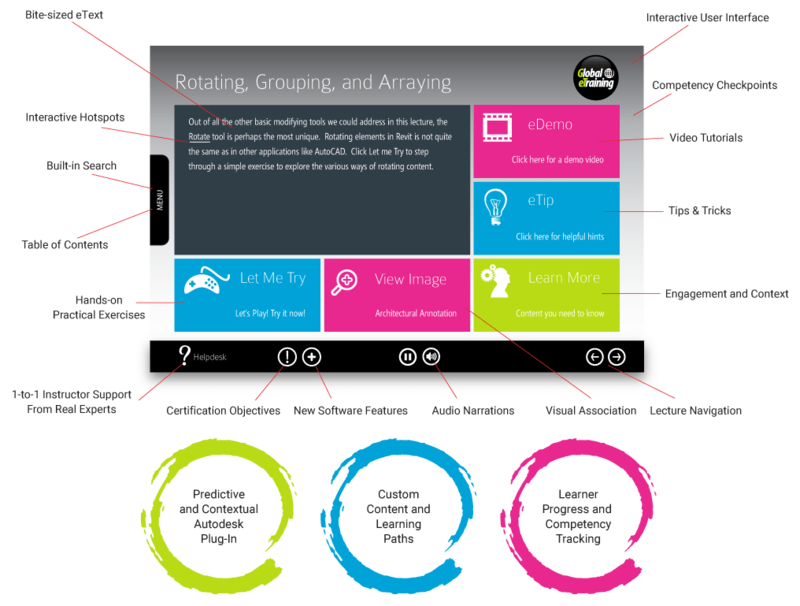 While navigating GeT Interactive, participants can interface with the high-quality and professional content using their preferred styles, supported and enhanced by the built-in complementary styles, leading to a higher level of understanding and knowledge retention. Learn and master today’s most popular CAD, BIM and Productivity software.